Both bees and yellowjackets can deliver painful stings. That’s probably the reason most folks associate the two different kinds of insects and would rather avoid them. At the same time, they generally behave differently and each have their own roles to play in the local ecosystem. In any case, recognizing the difference between yellowjackets and bees can help you make good decisions about avoiding them, clearing them off your property, and treating stings. Bees Vs. Yellowjackets: What’s the Difference? Of course, there are different species of both wasps and bees. Typically, references to bees refer to honey bees and bumble bees. Wasps include hornets, mud daubers, and paper wasps, but the more aggressive yellowjackets get the most attention. You can expect the kind of bees that you find in your own garden to avoid you unless you accidentally stumble into them or provoke them in some way. Yellowjackets don’t need much provocation, and they have even been known to chase people in order to sting them when they feel threatened. In addition, bees can only sting you one time. The barbed stinger is attached to their digestive system and once they lose it, they will usually perish shortly afterwards. Yellowjackets are usually capable of delivering multiple stings. Yellowjackets and other wasps tend to have more slender bodies with a “waist,” while bees almost look plump in comparison. Up close, you might notice that bees have hairier bodies and a pollen basket on their hind legs, but you probably don’t want to get that close. 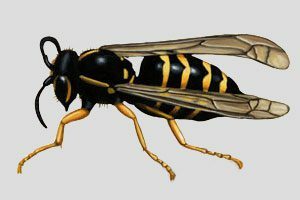 Most yellowjackets have vivid yellow and black markings. While bees are less likely to go out of their way to sting you, they’re not always predictable, especially if you are near their nest. From a distance, you might make a distinction between bees and yellowjackets from their behavior. Since bees collect pollen, they are likely to fly in somewhat lazy circles around flowering plants. You are more likely to see yellowjackets darting to and from their nests. Yellowjackets and other wasps mostly eat other insects and carry prey back to the nest to feed their young. The sight of a few honey bees around your flowers should not alarm you. But, you should probably have concerns about nearby nests if you spot yellowjackets. You can try to gently scrape the stinger out from your skin with tweezers or credit card. You can apply a wet chamomile tea bag or a paste of baking soda and water to sooth the sting. Naturally, you should only try these home remedies if you suffer from mild symptoms. If you experience hives, trouble breathing, a swollen tongue, or other symptoms of an allergic reaction, you should seek urgent medical treatment or call 911. If you see lots of wasps around your yard, you can bet that they are nesting somewhere nearby. You might look for a yellowjacket nest, in a hole in the ground, in a tree or shrub, or even in your attic. Both yellowjackets and honey bees will occasionally nest inside wall voids. Even if you spot the nest, you’re better off calling for professional help to remove it for your own safety. If you see a large population of bees or yellowjackets, and especially if somebody in your household has an allergy to stings, get professional pest control services to serve the intruders an eviction notice. Even though you have a right to be wary around either yellowjackets or bees, both of these creatures do have a role to play in the environment. For instance, honey bees pollinate flowers, fruit trees, and other important plants. Wasps consume flies, aphids, and other insects, so they may help reduce the population of insect pests. Of course, if you have ever been stung by a yellowjacket, you probably hope that wasps can continue to chase their prey at a distance from you. If you want to rid your home of stinging insects effectively, safely, and humanely, you can call us here at Colonial Pest Control for immediate assistance at 1-800-525-8084.